Balmoral, in Scotland's Cairngorm National Park, is one of Queen Elizabeth's private homes. It's the place where she, members of the royal family and their invited guests spend August to October. You're invited to visit too. If you'd like to drop in, though, you need to plan and book your tickets well in advance. Unlike Windsor Castle, the British monarch's weekend getaway, open whether the royal family is in residence or not, Balmoral (like Sandringham where the royals spend Christmas), is a private family estate. It is closed during August, September, and October. Even when it is open to the public, only limited areas can be visited, but those give a fascinating insight into the private life of the British monarchy. The Ballroom, which contains an exhibition of paintings, works of art, porcelain, the Balmoral Tartan Collection, and other items from the Castle. This is the largest room at Balmoral and the only one actually open to the public. The rest of the interior is a private residence. Exhibitions in the Ballroom change from year to year so if you've visited once, you'll very likely see something different the next time you come. The Carriage Hall Courtyard with its exhibitions of Royal Heraldry, commemorative china, and displays of native wildlife in their natural habitat. Once again, exhibitions are likely to change from year to year in this area. Garden Cottage - Queen Victoria's retreat, where she wrote her diaries and often ate breakfast. It is not open to the public but you can take a peek inside through the window. It is arranged much as it would have been during Queen Victoria's day. Luxury Landrover Safaris - Guided tours of the wilder reaches of the estate in the Cairngorm mountains are offered mornings and afternoons during the opening season. participants are offered the loan of top quality Swarovski Optik binoculars to spot wildlife during the tours. 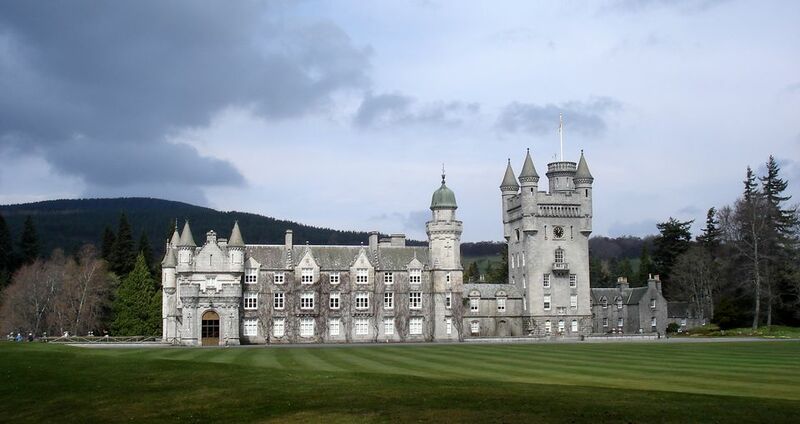 When Balmoral Castle is open to the public, the Ranger Service offers a series of easy guided walks. Throughout the Autumn and winter, walks ranging from easy hikes and family outings to mountain walks up Lochnagar are also scheduled. The walks are free of charge but must be booked in advance and the normal admission for a Balmoral visit applies. Crathie Parish Church, where the Royal Family attend church services on Sunday mornings, can be visited from April to October. Sunday services are 11:30. Royal Lochnagar Distillery - A small, working Scotch whisky distillery, open year round, with inexpensive guided tours and tastings on the hour until 4 p.m. from April through October and frequently scheduled tours for the rest of the year.